Eclampsia is defined as the occurrence of one or more convulsions in a pre-eclamptic woman in the absence of any other neurological or metabolic causes. It is an obstetric emergency affecting approximately 5/10,000 pregnancies, with a maternal mortality rate of 1.8% and a fetal mortality rate of up to 30%. The majority of seizures occur in the post-natal period (44%), but they can also occur in the antepartum (38%) or intrapartum (18%) settings. In this article, we shall examine the risk factors, clinical presentation, complications and management of eclampsia. All patients with pre-eclampsia are at risk of developing eclampsia. The risk factors for pre-eclampsia are listed in Table 1. The hallmark feature of eclampsia is a new onset tonic-clonic type seizure, in the presence of pre-eclampsia (new onset hypertension and proteinuria after 20 weeks’ gestation). The seizures typically last around 60 to 75 seconds, followed by a variable lasting post-ictal phase. Maternal convulsions may cause fetal distress and bradycardia. Right upper quadrant pain +/- jaundice. Visual disturbances e.g. flashing lights, blurred or double vision. Fig 1 – Features of eclampsia. A) Peripheral oedema in the ankle region, indicated the persisting indentation of the fingers. B) Papilloedema, observed via fundoscopy. Eclampsia is usually a multi-system disorder and is associated with a number of serious maternal and fetal complications. Death (1.8 %) Intrauterine growth restriction (IUGR). In the assessment of any seizure during pregnancy, it is important to differentiate between eclamptic seizures, and those caused by other medical disorders. Patients with eclampsia generally have features of severe pre-eclampsia prior to, and accompanying, any convulsions – which aids in diagnosis. Other causes for seizures during pregnancy are listed in Table 3. Investigations in suspected eclampsia are used to exclude other reversible causes (such as hypoglycaemia), and assess for any complications (such as DIC or HELLP syndrome). FBC: ↓ Hb, ↓ platelets. U&Es: ↑ urea, ↑ creatinine, ↑ urate, ↓ urine output. LFTs: ↑ ALT, ↑ AST, ↑ bilirubin. Abdominal ultrasound may be performed to estimate the gestational age and to rule out placental abruption which can complicate eclampsia. CTG monitoring is likely to indicate evidence of fetal distress and bradycardia. It may be necessary to rule out other causes of seizures if there is any doubt regarding the diagnosis of eclampsia. For instance, if there is a history of head trauma or seizure onset in the 1st trimester, this is more likely to be associated with CNS pathology and requires a full neurological work-up including CT/ MRI head. 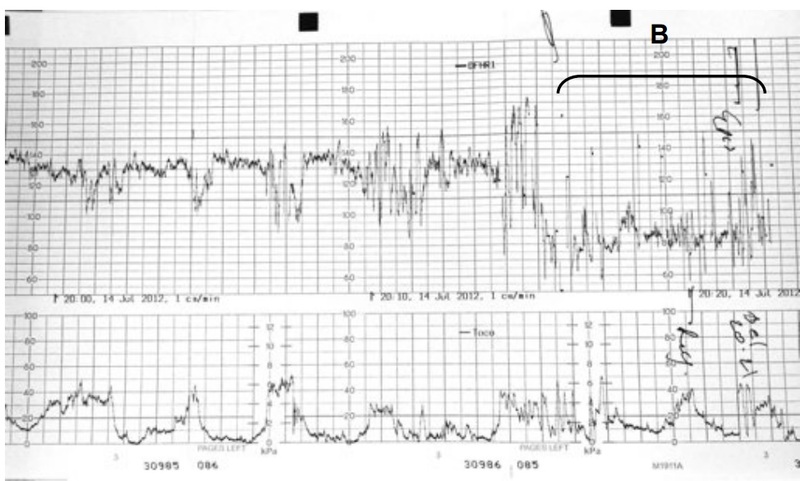 Fig 2 – Cardiotocogram indicating fetal distress. Bradycardia is observed in the bracketed segment (B). There are 5 main principles to address in the management of eclampsia, each of which are discussed in turn below. ABCDE assessment and intervention as appropriate. Patient should lie in the left lateral position, with secured airway and oxygen therapy. Eclamptic seizures are treated with magnesium sulphate (Table 4). The patient should be assessed for signs of hypermagnesaemia (hyper-reflexia, respiratory depression), and the fetus monitored via continuous CTG. Prophylaxis 4 g in 100 ml0.9 % NaCl. 1st seizure 4 g in 100 ml 0.9 % NaCl. Maintenance 1 g hourly for 24 hours. Recurrent seizures 2 g bolus. Note: Magnesium sulphate should be continued for 24 h after delivery/ last seizure, whichever is later. The two most commonly used intravenous anti-hypertensives are labetalol and hydralazine. A target mean arterial pressure (MAP) of <120mmHg is used. A rapid decrease in maternal blood pressure can cause fetal heart rate abnormalities. Therefore, continuous CTG monitoring is used during and for 30 minutes after giving IV anti-hypertensives. The only definitive treatment of eclampsia is delivery of the fetus. However, the mother must be stable before delivery – with any seizures controlled, severe hypertension treated and hypoxia corrected. This is the case regardless of any fetal compromise. Caesarean section is the ideal mode of delivery. However, intrapartum seizures in established labour may be managed by vaginal delivery. After delivery, the patient will require HDU care until she is stable – well controlled blood pressure, adequate urine output, and discontinuation of MgSO4. This usually takes a minimum of 24 hours. Fluid balance monitoring is important to prevent pulmonary oedema and detect acute kidney injury. Indicators of complications of eclampsia should also be monitored – such as platelets, transaminases and creatinine levels. Regular symptom review – e.g headaches, epigastric pain. Bloods 72 hrs post-partum – FBC, LFTs, creatinine. Pre-conceptual counselling – advice regarding minimising risk factors and prophylaxis for future pregnancies. Consider CT Head – if persistent neurological deficit. Measure BP – in the UK, blood pressure is checked daily for 2 weeks post-partum. Eclampsia is a complication of severe pre-eclampsia and is an obstetric emergency. It is defined as one or more new onset tonic-clonic seizures in the presence of pre-eclampsia. The majority of seizures occur within 4 days’ post-partum. Investigations are to exclude other diagnosis and assess for complications e.g. DIC, HELLP syndrome, fetal distress. Neurological imaging is not routine. Delivery of baby only when mother stabilised, regardless of fetal compromise. Postpartum monitoring and post-natal follow-up are important. Which of the following is NOT a risk factor for eclampsia? Last pregnancy 12 years ago. Twin Pregnancy. Previous pregnancy. Pre-existing CKD.